Rubber stamping techniques are a great way to make any invitation and some are so simple to produce. There is a huge array of stamps available online and in your crafting stores. With the right image you can create the best invitations ever. I have found some of my favorite stamps in the bargain bins at Michaels and in the crafty section of our local department stores. You can also find a huge selection of patterned papers that have been discontinued as well. It definitely pays to keep your eye out for a bargain. These invitations were created by Alice Golden. She has used stamps from Technique Tuesday's Urban Invites range. 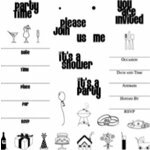 With this stamp set you can create stamped invitations for dinner parties, a birthday bash, bridal or baby showers. Pretty much any party you can think of. They would be a good set to have for any future celebrations you will be hosting. You can see how easy it is to make these pocket invites. 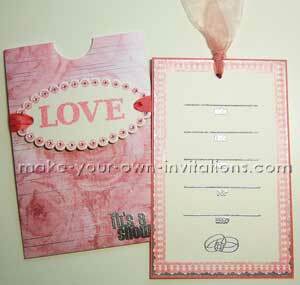 Create a pocket to hold the party invitation insert. We have a pocket invitation template that you can use along with instructions to assemble the pocket or you can take a look at the pocket invitation tutorial that we have. Stamp the words LOVE onto a scalloped die cut tag (any shaped tag will be fine) Punch two holes, one at each end of the tag and then thread some ribbon through the holes and around the pocket. 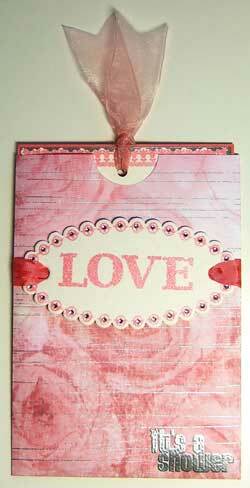 Stamp the party details onto plain white cardstock and mounted that on to pink cardstock. A hole has been punched and threaded through and tied off creating a pull tab to extract the invitation insert out of the pocket.